Commissioner Rodney Creech discusses the commissioners’ decisions on what to do with grant money during the Senior Fair Board meeting on Thursday, June 18. EATON — During a meeting on Thursday, June 18, Preble County Senior Fair Board held a heated discussion regarding the best use of $875,000 awarded by the state. County commissioners outlined a plan and presented it to the board, detailing various upgrades to buildings throughout the grounds, including much-needed work on the grandstand. Fair Board member Mary Bullen pushed back at the meeting, voicing her displeasure with the decision. She noted the senior fair board decided the money should go toward projects that improve the safety, economic development, and overall look of the fairgrounds. She felt that upgrades to the electrical system throughout the grounds, and the addition of restrooms and showers to the Expo Center, were the most beneficial. Other members on the board did not side with Bullen on the issue. Commissioner Rodney Creech was also at the meeting and addressed Bullen’s concerns. He stated that the original list of items handed to him by manager James Mays, detailing what should be upgraded, did not include electrical concerns. It wasn’t until he received another list from Mays on April 13 that electrical upgrades were finally listed. Creech also acknowledged that electrical upgrades are going to be critical for the fairgrounds, but upon inspection there are no safety issues, just normal maintenance, that is currently needed. Bullen disagreed with Creech on the timeline he was portraying, and said that fixes to the electrical unit, over a few years, will reduce the cost greatly and will pay for themselves in time. He continued, commissioners plan to use any money left over from the upgrades to go toward electrical improvements and said they are already looking at future grants. He has a vision to add a unit onto the Expo Center that includes bathrooms and showers, but also includes a kitchen and meeting rooms. “If the Expo was number one and electrical was two – we’re not fixing the grandstands. Not getting pavement. Those are the two biggest safety issues,” said Creech. Construction is expected to start within 30 days, with some improvements being finished by fair time. The board passed the commissioners’ list with only Bullen opposing the motion. In closing the argument, Bullen voiced her displeasure on the process. Other board members stated that they did not feel “dishonored” and that it was only Bullen’s opinion. 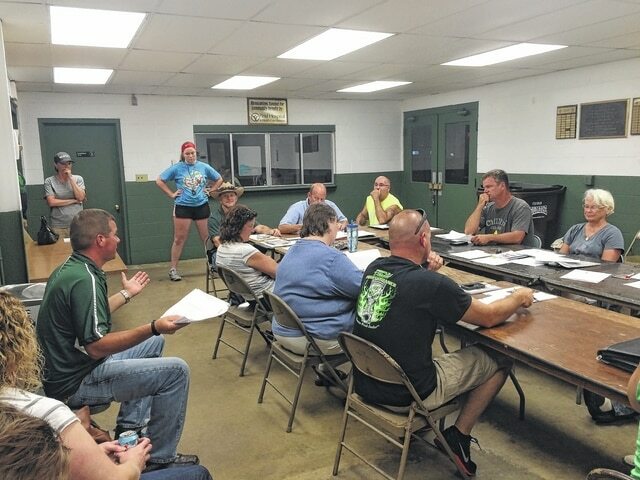 In other business at the meeting, the Ohio Department of Agriculture has determined that eggs can be allowed at the fair as long as the eggs are “clean.” Thus, the Preble County fair will now include eggs. All other poultry still remain banned. The board also approved a raise for EMT personnel at the fairgrounds, bringing them from $8 per hour to $10 per hour. The board renewed a contract with Dayton Power and Light which locks the Fairgrounds in at $.6375 per kilowatt through 2019. It was announced swings will be added to the Rotary Junction area, as they are being installed by area Boy Scouts for a project. The board will be asking the Brooke-Gould Memorial Foundation for a $12,000 grant to be used for a new flag pole. The meeting closed with members of the Junior Fair Board discussing their concerns on not being included by the Senior Fair Board. The group claimed to have never received notification from the 4-H office about the ODA’s decision to ban poultry, and are displeased with the communications during this process employed by the Senior Fair Board.